Know this – CoolSculpting is both a fine art and a precise science. The art of CoolSculpting starts with understanding how to contour every client’s unique body to enhance their natural curvature. To gain optimal results is critical to work with the right CoolSculpting professional who understands both the art and science. If you find someone who only understands the art of curvature, but not the science, the results could be your body appearing lumpy. Or if you work with someone who only understands the science, but not the art, and you might miss having the perfect appearance and curvature you want – and deserve. Subcutaneous fat, the fat eliminated with CoolSculpting treatments, is different from visceral fat cells, the fat that surrounds your organs and causes you to gain weight. To lose weight you must shrink visceral fat cells. CoolSculpting does not treat visceral fat cells, so CoolSculpting does NOT help you lose weight. Subcutaneous fat can create a heavy illusion particularly under the chin or on the Neck. There are 5 Very Good Reasons to use CoolSculpting to give you a slimmer appearance, read more! Interestingly, when we gain weight the fat cells in our body get bigger, and as we lose weight those same cells get smaller. With people who are within their normal body weight, the number of their fat cells is determined during early adolescence and remains relatively consistent throughout their lives. Our fat cells are replaced at about 10% per year so as the fat cells are removed through CoolSculpting it takes time for them to replenish. Subcutaneous fat can create a heavy illusion, particularly under the chin or on the neck. The hard part is over, time to schedule your first appointment. 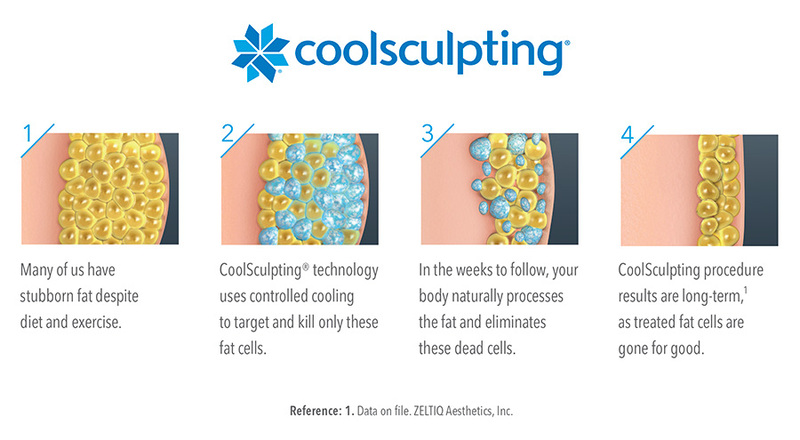 Your CoolSculpting professional will confirm and mark the areas to be treated during the session. The CoolSculpting applicators will then be strategically placed on the area or areas to be treated, per your treatment plan. Once the session begins, there will be a 10-minute period where the treated areas gets very cold. After the area will be numb and you’ll relax, often watching movies on their devices, eating, working, reading or even taking a nap. The treatment varies between 30 to 90 minutes depending on the area or areas being treated. Multiple areas are often treated per visit. Once time is up, the applicators are removed and a light massage on the treated area begins. This massage increases the efficacy of the treatment by 60%! CoolSculpting is a “lunchtime treatment” meaning, there is no downtime associated with it. After your treatment, the area might be a little sore, tender to the touch or have very light, but unnoticeable to others, swelling. You’ll return in 60 days for check-up appointment. During this appointment, we will determine progress, review before and after photos and discuss if any additional treatments are desired.